Combine an RV lifestyle with country club living and Florida's tropical climate for the ultimate getaway. This resort features a 9-hole course, putting green and driving range; a full service restaurant; heated pool and more! Great campground and very large sites, very nice. Nice café and waterfront. Unfortunately the internet was useless. We were directly across from the laundry building which had the tower. All day long no signal, no connection and no internet. However it did work slowly in the middle of the night. Tengointernet and Grand Lake really need to deal with this poor service. No wonder most RV users had their own internet hotspots and Tengointernet said that was probably the interference issue. The lots are large with a lot of space between you and your neighbor. We had a grassy lot with no shade. There are a lot of other lots with shade trees which is nice during the summer heat. There are no tables on your lot. 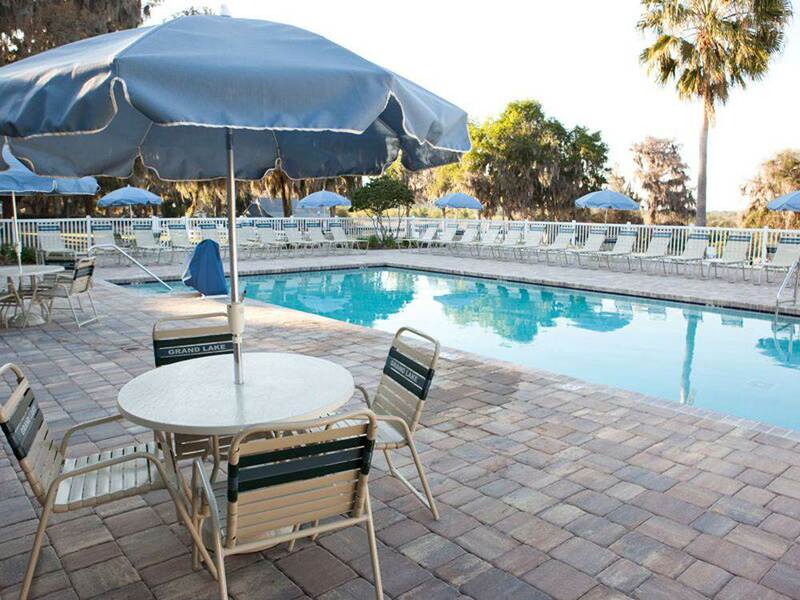 We used the pool which was maintained well and the park grounds are also clean. The office and pro shop staff was friendly. The review would be 5 stars if I didn't have to pay 5.00 extra for each of my kids for just a one night stop over. The park is very quiet and close to the interstate. Located on Orange Lake, roughly half way between Gainesville and Ocala. This resort is a combination seasonal and short term destination, with a mix of cabins, long term RV spaces and short term sites. Mixture of concrete and grass pads all roads are paved. Full amenities include 9-hole golf course, pool, fitness room, on-site restaurant on the lake, pickle ball, shuffle board etc. All facilities were in great shape and well run. WIFI and cable. We stayed two months and thoroughly enjoyed it. The office personnel were great, and worked with us when we needed to schedule some offsite RV maintenance (moved to one of their cabins when our rig was in the shop). It was great having a restaurant on site with screen porch, right on the water. Rates vary based on time of year and length of stay. Passport America usable on grass sites. Would definitely return. The entrance was beautiful and the female employee taking our reservation was so nice and helpful. The cost appropriate. The restrooms while clean, were marginal compared to recent campgrounds we stayed. I was having coffee in the morning at the picnic table and was stung by red fire ants. I noticed they were also around our truck tires. It seemed the sites were not well maintained. We stayed only one night. Large lots but no table. Clean and well maintained. Staff at the office were not very implicated it was our first time there and we came at office closing time around five they only told us to go back at the entrance and help ourselves. We were planning to stay for a week but changed our mind because it is mainly for golfers and not much more to do. Nice wide lots; some shaded some not. A lot of empty spaces now due to yearly leases and the snowbirds are not here yet. Friendly staff and fellow RVers. Very quiet park so you can sleep as late as you want. On site restaurant with good food at reasonable prices, On a big lake and golf course, If you're a gambler, there's a converted jai alai fronton that's a poker palace near the entrance to the park. 25 minutes to Gainesville to watch the Gators play and about the same distance to Ocala. We like it so much we will probably stay thru winter before heading up to Idaho.